Consumables are items in The Division that grant you a temporary buff after activation. They can be found throughout the game, but you are not forced to consume water or food to survive like it works in other games. Canned food increases healing effects on player by 40%. The energy bar instantly removes all negative Status Effects on the player and protects the player from all Status Effects for 5 seconds. Water increases all damage dealt to elite NPCs by 20%. Soda reduces all cooldowns on skills by 30%. Incendiary bullets have a chance to light a target on fire . Explosive bullets have a chance to deal area of effect damage. 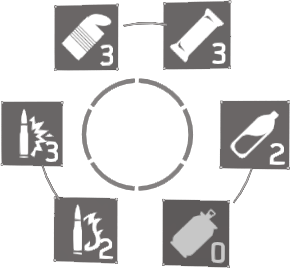 Although it’s not directly part of the consumables wheel, medkits heal damage over time when consumed, while you can carry a maximum of 5 packs at the same time.